Corporate social responsibility or doing our bit as we like to refer it as, is about everything we do as a business - it isn’t an added extra, it forms part of our business as usual. We love to support our local communities into doing their bit for the environment, for local good causes and for the improvement of broader social issues. We aim to deliver value to our customers, communities and our own business through being a fair, responsible and efficient retailer. Our business takes responsibility for its actions, commits to minimising any negative impact on people, the environment and invests in the communities in which we serve. At wilko, we source products our customers want, at the best price they can afford, from suppliers around the globe, to deliver quality and value. Sourcing products and services in a responsible way is central to our values and vision, and we work to ensure our sourcing practices will not harm or disadvantage those who produce them and that they have the lowest possible impacts on the environment. In addition we set out our plans and annual progress within our Modern Slavery Statement. As a retailer with strong family values we believe in conducting our business with integrity - acting in an open, honest, fair and balanced way in everything we do. This principle is fundamental to the way we do business and reaches every part of our organisation. It also means we nurture an open and respectful working environment in which it is easy to voice any concerns over misconduct or dishonest practices without fear. For even more information, we have this detailed within our Ethical Pratices Policy. For the issues that matter most to us, we have developed specific policies. We always aim to comply with tax laws and practices wherever we operate. Find out more in our tax statement. Every large business has faced increased environmental challenges in recent years. 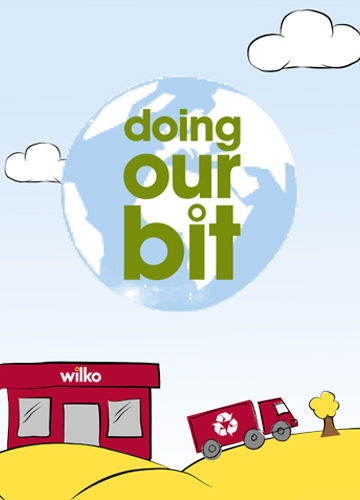 Here at wilko we understand that change towards a more responsible and sustainable society is needed – and we’re determined to play our part. We look at every aspect of our business to ensure that the direct and indirect impacts of our operation don’t result in lasting damage, and are as environmentally friendly as possible.